568 pages | 57 B/W Illus. Written by two experienced lecturers, this is the first student-centered textbook to bridge the technical and theoretical aspects of management accounting change. Packed full of pedagogical features, including mini-cases, learning outcomes, key terms, article summaries, key concept boxes, real-world cases, chapter summaries and further reading suggestions and resources, it is clear and accessibly written, covering all the major emerging topics in management accounting theory. 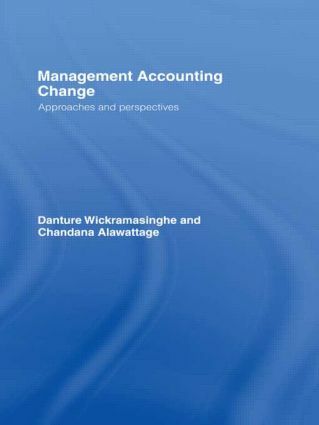 provides a number of alternative theories through which the transition of management accounting from mechanistic to post-mechanistic approaches can be explained – elaborating both rational and interpretive/critical theories. This excellent text meets a desperate need for an advanced management accounting textbook that incorporates theory and practice and is accessible and engaging for all those studying in this challenging area. Danture Wickramasinghe (B.Sc., M.Com, M.Sc., Ph.D.) obtained his PhD from the University of Manchester where he also teaches management accounting and control. He has taught management and accounting in a number of universities over 20 years and has publications in Accounting, Auditing and Accountability Journal, Critical Perspectives on Accounting, Financial management (UK), Advances in Public Interest Accounting, and Journal of Accounting and Organizational Change. Chandana Alawattage (B.Sc., MBA., Ph.D.) obtained his PhD from Keele University and teaches management accounting at the University of Aberdeen Business School. He has taught management accounting and related subjects in a number of universities over 10 years and has publications in Critical Perspectives on Accounting, Journal of Accounting and Organizational Change and a number of conference proceedings in critical accounting.